Create your own interiors in the style you want. 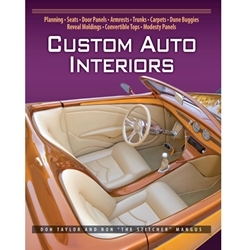 Expert trimmers Don Taylor and Ron Mangus share two lifetimes of auto upholstery experience and secrets in this fantastic book. Over 800 color photographs capture every detail you'll need to create your own exciting and award-winning custom interiors. Precise step-by-step instructions show you how to turn out completely professional custom interiors.